Beautiful, durable, and entirely unique, hardwood floors are a wonderful	choice for modern and traditional homes alike. With a wide selection of	wood types available today, it is easier than ever to choose a hardwood	floor that reflects the unique style of your home or the beautiful Northern	Virginia outdoors. Here at Alexandria Carpet One Floor & Home, we	offer a wide range of hardwood flooring options, as well as expert hardwood-flooring	installation. Based in Alexandria, VA, we proudly serve our city and all	of Northern Virginia. If you are thinking about getting a hardwood floor	installed in your home, read on for our comprehensive guide to hardwood flooring. Beautiful, durable, and entirely unique, hardwood floors are a wonderful	choice for modern and traditional homes alike. With	a wide selection of wood types available today, it is easier than ever to choose a hardwood floor that	reflects the unique style of your home or the beautiful Northern Virginia	outdoors. Here at Alexandria Carpet One Floor, we offer a wide range of	hardwood flooring options ready to be installed in your home. Based in	Alexandria, VA, we proudly serve all of Northern Virginia. If you are	thinking about getting a hardwood floor installed in your home, read on for our	comprehensive guide to hardwood flooring. Hardwood offers an understated character and beauty that continues to grow	on you. Today’s wood floor offerings are milled & finished using	the latest techniques, resulting in lower maintenance than wood floors	produced in years past. You get the beauty and character you desire for	your home in a floor that’s designed to look great for years. The natural imperfections, knots, and grains of hardwood are true to nature. These key characteristics of hardwood flooring lend an authentic, warm	flavor to your home, which will continue to impress you for years to come. Fill your home with the character of beautiful hardwood floors, and let	this act as the base to help you fill your home with memories. Hardwood flooring sets an unforgettable, time-honored tone throughout your	home. From the pale tones of warm Southern Yellow Pine to the dark chocolate,	deep tones of Black Walnut, there is such a wide variety of hardwood species	to choose from. Visit Alexandria Carpet One today. Choose from our beautiful selection of named brand hardwoods. Not sure what type of hardwood flooring is right for your home, office,	or retail shop? Rely on our friendly and knowledgeable team of flooring	specialists for assistance. Speaking to our experts, you will find that	all of your questions will be quickly answered as we help you navigate	through the options available to you at our showroom. No matter what size	or shape you need, there are essentially just two types of hardwood flooring	to consider. Engineered hardwood flooring	the first major type of wood floor available to you, is constructed using	multiple layers, including genuine wood and resin, to provide you with	unrivaled strength and durability. This type of hardwood floor is specifically	designed to withstand extreme temperatures as well as a moderate amount	of foot traffic. Looking to add wood flooring to a commercial business,	busy hallway, or entranceway? Then engineered hardwood flooring might	be the best fit for your needs. Solid hardwood flooring	, on the other hand, provides its own unique collection of benefits that	make it a great choice for residential properties. These wood floors boast	an incomparable beauty and depth that add both beauty and value to any	kind of property. When you invest in the stunning aesthetic of solid hardwood	flooring, you are not only increasing the visual appeal of your residential	or commercial structure, but also the value of the property as well. The proper	installation of your new hardwood floors is just as important as picking out the right	type of flooring for your home. If your new floor isn’t installed	the right way, then it may not last as long or look as great as it should. 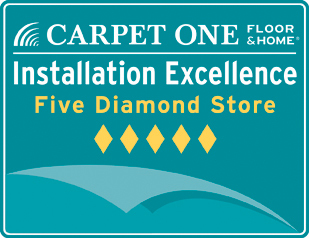 Here at Alexandria Carpet One Floor, our flooring installation specialists	are highly skilled and passionate about what they do. We bring exemplary	craftsmanship and dedicated attention to detail to each and every one	of our flooring installation projects, and use our specialized knowledge	of each flooring option to install them all perfectly in homes across	the region. We can install any floor we sell the right way, the very first	time — saving you time, money, and hassle. As a highly intensive process, flooring installation can often disrupt	a quiet home. Our technicians take the greatest care to ensure that our	work is done quickly and correctly —all while causing as little	disturbance in your home as possible. Work with	our technicians at Alexandria Carpet One Floor for your next hardwood flooring installation project, and see the Alexandria	difference!